Meet Wee Taps, a duo based in Belgium that creates fun, high quality kids’ apps with clear creative and educational values. Designer/illustrator Paddy Donnelly and developer Alain Hufkens want kids to be able to play safely on an iPhone or iPad without their parents worrying about in-app purchases or third party advertising. With that philosophy in mind they have already created a great number of wonderful apps including Wee Rockets (kids build their own rockets to rescue aliens), Wee Subs (similar to Rockets, but with submarines), Learny (a host of animal friends teach kids about colours, shapes and letters), Sleepasaurus (a bedtime ritual app with dinosaurs), Moon Tunes (a colourful music player for kids) and Wee Puzzles (puzzles for toddlers). 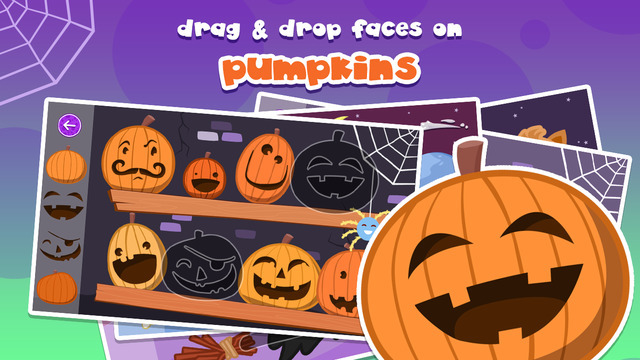 Their latest release is called Halloween Wee Puzzles and is a free, stand-alone app with the same drag & drop puzzle gameplay as the previously released Wee Puzzles, but with a brand new, lighthearted Halloween theme that toddlers will surely enjoy. The app also helps children to develop their motor skills and recognise shapes, so it delivers both fun and education!